I let my 14 year-old stay up past her bedtime to watch some of the Academy Awards show. It was a wonderful bonding experience for us. While winning an Oscar is a near impossible dream, it’s a cakewalk compared to having a meaningful conversation with a teenager. I was blessed with a funny and profound conversation with my daughter. Questions at the dinner table are invariably met with a monosyllabic response, usually “good” or “fine.” But somehow the backdrop of gratitude for getting to break the bedtime rule, a couch setting that supports a lack of eye contact, and a TV show providing a ready escape if the conversation gets uncomfortable, we had one of our most meaningful conversations ever. An unexpected gift. It was the perfect opportunity to discuss careers in the movie biz, how comedy works, sexual harassment, different lifestyles, and most importantly, inclusion and acceptance. I have discovered the secret of good parenting — watch more TV. I’m a big Jimmy Kimmel fan, and he’s one of the best at surprises. Remember his “Worst Twerk Fail EVER – Girl Catches Fire” Prank, with 23 million views on YouTube? Last night’s surprise topped it. Driving the brilliant bit was genuine gratitude. It filled both theaters with joy, and I was rolling on the floor laughing, because by this point, I had reverted to being an annoying dad and my daughter had kicked me off the sofa. I loved seeing Jordan Peele win best original screenplay. I’m not a fan of thrillers and probably won’t go see “Get Out,” but I respect him so much for his creative genius. If you haven’t seen Sam in “The Way, Way Back” with Toni Collette, Steve Carell, Maya Rudolph and Oscar winner Allison Janney, do yourself a favor and watch it this weekend. On the couch with your teenager. Armando Iannucci, creator of HBO’s Veep, built a brilliant team of genuinely friendly and supportive people, which gives the cast a great deal of freedom. The actors don’t need to be cautious to tiptoe around egos. This fosters a fun, relaxed environment that encourages risk-taking. I would imagine that kind-hearted actors are also required for the show, since much of the comedy comes from hilarious, caustic insults, certainly to be true to life inside the beltway. One of the first audience questions was “What’s your favorite Jonah insult?” Turns out it’s a barb from Julia Louis-Dreyfus’ character, speaking to Matt Walsh about Timothy Simon’s character: “You let that unstable piece of human scaffolding into your house?” Critics agree — that berating ranked #3 on Hollywood.com’s list. If you’re still considering your favorites, reference the research from the Chicago Tribune and Rolling Stone (headphones are suggested for this video). Early in his career, Tony was acting in plays and TV commercials in NYC as he focused on his dream of working on a sitcom. After he finally landed the role, he realized it didn’t offer the satisfaction he had anticipated, and later reflected that there was no way the experience could ever live up to the expectations he had imagined. He had missed out on being in-the-moment and truly enjoying some of his earlier experiences. This lesson of contentment inspired him to write a children’s book, Archibald’s Next Big Thing. Tony shared insight into some of the scary moments in his life. One was on the morning of the 2013 Emmy awards, when Julia Louis-Dreyfus called him with an idea for a comedy bit to use in an acceptance speech. A last minute, unrehearsed live routine in front of 18 million people — what’s scary about that? The other fear that controls Tony’s life: Claire Underwood. 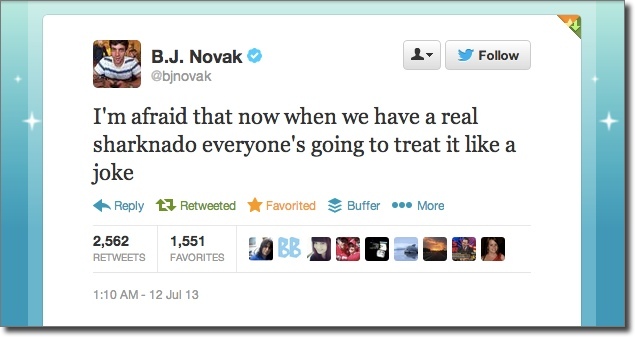 BuzzFeed documented the brutal Twitter threat-down. 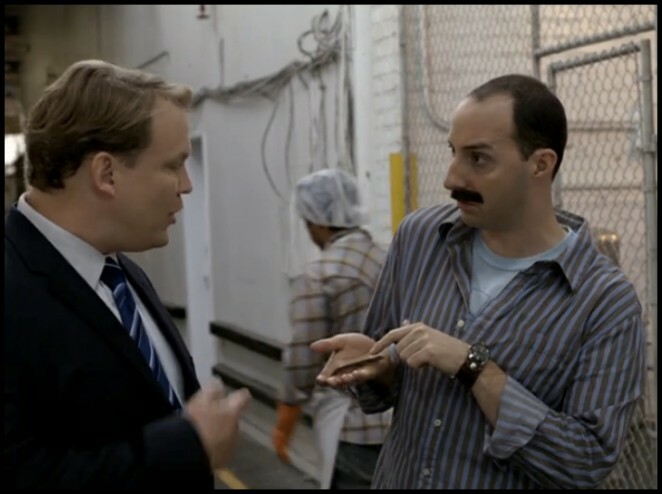 For more on the poultry theme, watch Tony as the mustachioed video store owner-turned detective and Andy Richter sidekick in one of the best ever TV comedy episodes in the history of the world. Andy Barker P.I., produced by Conan O’Brien. “Three Days of the Chicken, available on Hulu+, Amazon or iTunes. Catch Veep on HBO, Sundays at 10:30 PM ET. , on being content where you are. But it works in B2B content marketing. And this week, Hollywood confirmed this maxim, proving images of selachian fishes captivate an audience even without a good script or a decent story idea. 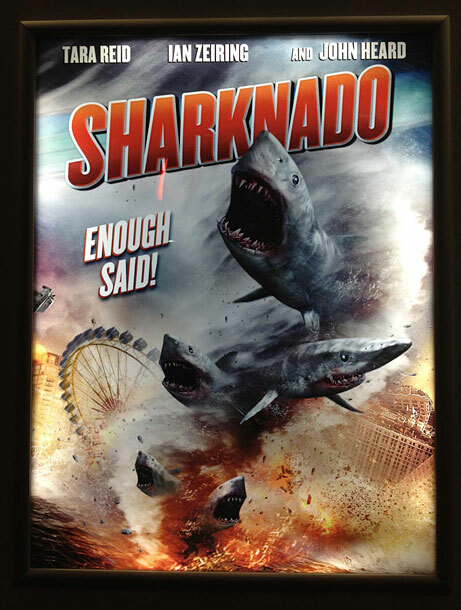 Nielsen pegs Sharknado’s TV audience at 1.4 million viewers, on par for other SyFy Channel original movies, which cost an average $1.5 million. 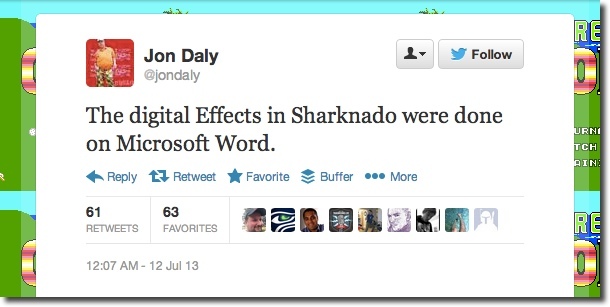 Syfy Digital SVP Craig Engler reported that the hashtag #Sharknado appeared 387,000 times on Twitter on Thursday night, hitting 5,000 tweets per minute at its peak. The social media success, including celebrity tweets, created press coverage for the film, and I would image helped to build a large audience that will make the film one of the most success reruns on the network. Although the Dollar Shave Club’s CEO revealed to the WSJ All Things Digital that the critical success factor for a viral video is to use a bear, Tina Fey clarifies which beast is best. If we’ve learned anything from Shark Week on Discovery Channel and literary classic characters like JabberJaw, if you want content to connect with an audience, just add sharks. Special thanks to Oakley Boren for creating this image at the Social Media Explorer OC conference. Our ghost tour guide, a Colorado University student, unintentionally convinced me that we were in the presence of the paranormal during the Stanley Hotel Ghost Tour because the only time she seemed to be relaxed and unscripted was when she was talking about the ghosts nearby. (See New York Times article about “Scary Mary”). I’ve been fascinated by the story of Stephen King’s failure, which led him to a frightening night in room 217, which then led to the novel that put him on the map, The Shining. It’s a beautiful and redemptive reminder to me that failure is a necessary part of the creative process. I’ve been trying to figure out a way to write and produce a dark comedy about the story. For now, I’ll use it as the topic of a new YouTube series: Better Marriage Through PowerPoint. This year at the Sundance Film Festival, director Rodney Ascher premiered his feature documentary “Room 237” which explores Stanley Kubrick’s interpretation of the story. (BTW, the hotel asked Kubrick to change the room number for the film.) Another Stephen King feature was announced last week — “The Breathing Method.” Congrats to my creative partner from the mainframe videos, Scott Teems, who wrote the screenplay! Special thanks to Barbara Barna Abel and Ann Handley for the creative support and encouragement on this PowerPoint video series. Thanks to Garth Beams for the animation, and Justin Balog at HOSSedia for this eerie shot of room 217. While sitting at this table 70 years ago at the Eagle and Child pub in Oxford, England, C.S. Lewis encouraged a reluctant young writer to publish the work he shared with the small group of friends, The Inklings. That young writer was J.R.R. Tolkien and the unfinished story he shared was “Lord of the Rings.” I’m guessing Lewis had no idea the film trilogy would go on to earn 30 Oscar nominations and $2.9 billion worldwide at the box office — he probably just thought it was a neat story. We’re studying The Inklings at Wedgwood Circle, a group committed advancing the good, true and beautiful in arts and entertainment. 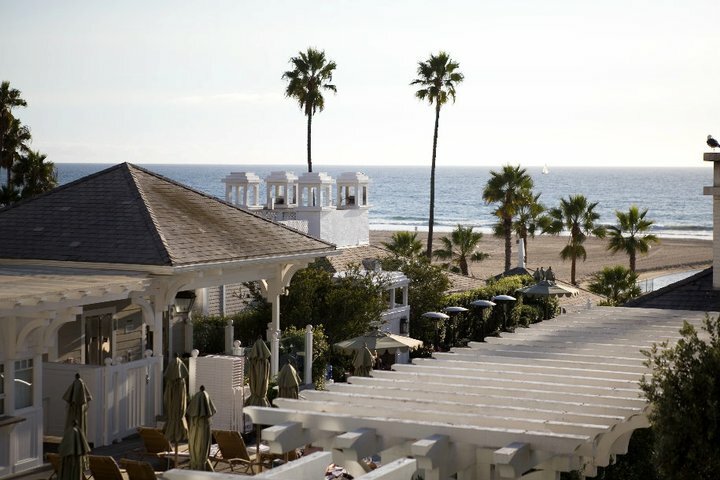 I emceed our conference at Shutters in Santa Monica, where we got a peak into some behind-the-scenes stories: Sean Astin on making Tolkien’s film (and The Goonies), Michael Flaherty of Walden Media on the Chronicles of Narnia, and Kiel Murray & Phil Lorin on Cars and their short film Kilo. It inspired me to work harder to try to create more of the good, true, beautiful and ridiculous. To be fair, it wasn’t a “thousand” stars, but more like two or three. And, it didn’t happen all in one evening, but was spread out over almost a fortnight. The celeb-fest kicked off when I had lunch with Spider-Man creator Stan Lee in Santa Monica. He was attending a small storytelling conference in Santa Monica, where I was speaking on a panel about comedy film. The following Thursday back in NYC, I went with Daily Show producer Ian Berger to Carnegie Hall to see Ricky Gervais, as part of the New York Comedy Festival. We went backstage after the show, and had the opportunity to critique Ricky’s act, and a few episodes of “The Office.” Also met Todd Barry and Janeane Garofalo, who is a lot less political in person. We hit the After Party at the Empire Hotel Rooftop bar. I don’t think I’ve stayed out that late since senior prom. 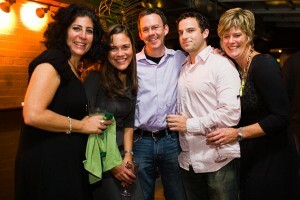 Photo: the WSJ gang Rhona Seymour, Melissa Magdits, Nancy McDonald and Ian Berger. Then, Friday night, my wife and I attended the NYC premier of THAT EVENING SUN. Hal Holbrook and Ray McKinnon were at the theater for a Q&A. 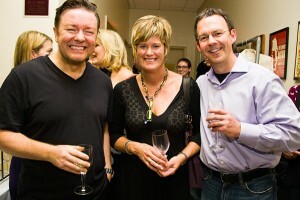 On Saturday night, I saw the film for the fourth time, and had drinks after with Scott Teems and Carrie Preston. UPDATE: selected as New York Time’s Critic’s Pick, The Hollywood Reporter says Holbrook deserves an Oscar nom, and Hammer to Nail compares Teems favorably to Clint Eastwood! Characters such as Abner Meecham (Hal Holbrook) and Lonzo Choat (Ray McKinnon) reminded me of some of my own flaws that I’d prefer to hide from myself. I saw a story of how regret can crush a man and fuel hatred making forgiveness almost impossible. Because of this film, I’ll work harder to extend grace to others, and to myself. The movie also stars Walton Goggins (“The Shield”), Carrie Preston (“True Blood”), Mia Wasikowska (Tim Burton’s upcoming Alice In Wonderland), Barry Corbin (No Country for Old Men), and Dixie Carter. The film won at SXSW and about 10 other festival awards, received a glowing review from Variety, and several of the Hollywood critics added to their Oscar prediction list Holbrook for Best Actor, and Scott Teems for Best Adapted Screenplay. 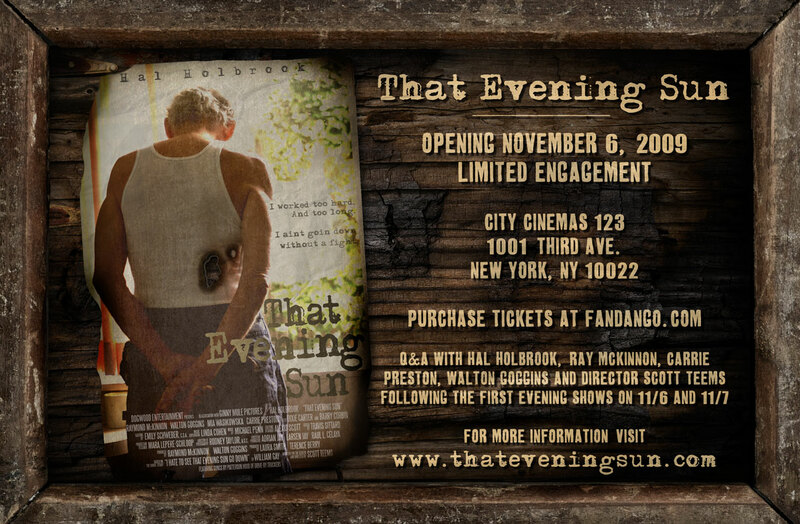 It opens this week in NYC at Cinema 123; purchase tickets online from Fandango. There will be a Q&A with the cast and director after the 7PM show on Nov 6th and 7th. I’ll be there on the 7th, for the third and fourth time. THAT EVENING SUN wins SXSW! Over the years we’ve seen some actors get that one big role late in their careers. Henry Fonda in On Golden Pond, Paul Newman in Nobody’s Fool, Richard Farnsworth in The Straight Story, Peter O’Toole in Venus and James Cromwell in Babe, Oscar nominees one and all. 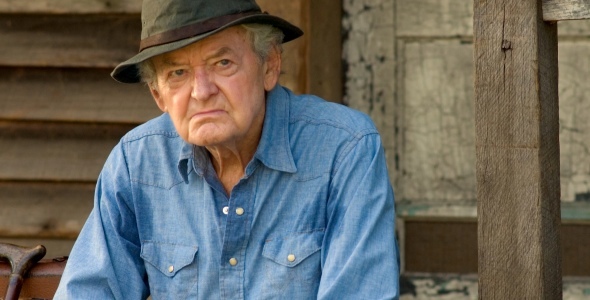 And some may consider Hal Holbrook’s nominated turn in Sean Penn’s Into the Wild to be that role for him. Certainly the best thing in that film, but director Scott Teems has gone a step further and done for Holbrook what Thomas McCarthy did for Richard Jenkins last year in The Visitor – given one of our great character actors a chance to shine in a lead role. And shine Holbrook does in That Evening Sun. I trust there will be a meaty role for me in the sequel, as Holbrook’s tax accountant. The human characteristic which holds the greatest potential to change the world is the ability to encourage others. And I absolutely love it when Hollywood uses its reach to do this. One of the best recent scenes comes from Peter Berg in “Friday Night Lights,” when Coach Taylor convinces his player Smash before his college football tryout. You listen to me. You listen to me closer than you’ve ever listened to me before. You remember that Rutledge game? Fourth quarter. You came into that game. You took over that game, play by play. You owned that game. I watched you that day and I said to myself, ‘that kid is going to go all the way.’ Right now, right here God has placed you to do what you do best. I’ll soak up this scene again before my next big audition.